A little bit of Antarctica in Wyoming. Episode: 60. Site Number: 103. Date Posted: 10 May 1998. Location: Granger, Wyoming, USA. Type: Miscellaneous. "Back in the eighteen nineties when Little America's founder was a young man herding sheep in a dreary section of Wyoming, he became lost in a raging northeast blizzard and was forced to camp out all night at the place where the original Little America now stands. On that long January night, in a terrible storm, with fifty-mile per hour winds and 40 below temperatures, he longed for a warm fire, something to eat and wool blankets. He thought what a blessing it would be if some good soul would build a house of shelter at that desolate spot. Many times in his heart he dreamed of a haven for travelers with a crackling fire, a warm bed, delicious food. In the nineteen-thirties when he saw Admiral Byrd's picture of "Little America" in the Antarctic and his isolation so many miles from his base camp, it reminded the founder of his experience in the Wyoming blizzard. The thought came back to fulfill his dream, to erect a haven of refuge on the spot of his harrowing experience. 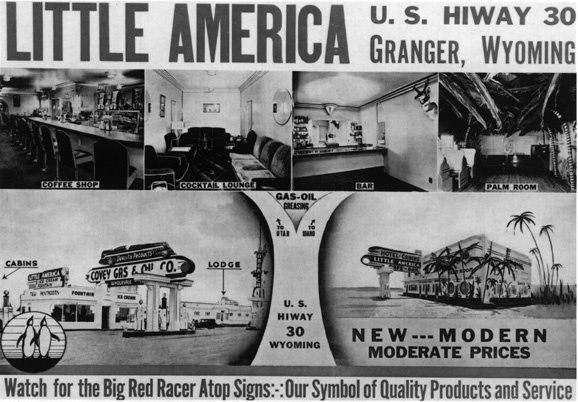 The name, of course, was a natural "Little America." From its beginning on Wyoming's southwestern desert, Little America has grown to include properties throughout the Western United States." There are also Little Americas in Cheyenne, Flagstaff and Salt Lake City. The original Little America ca. 1934.